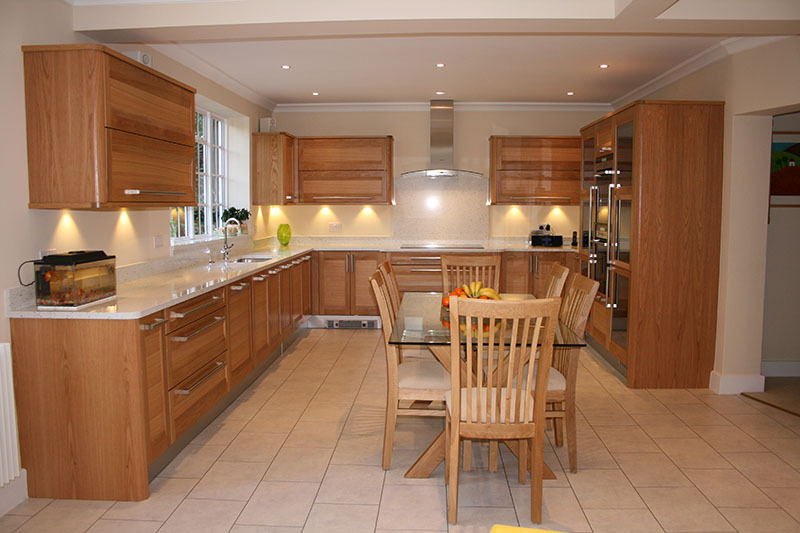 This kitchen is made in light oak furniture. 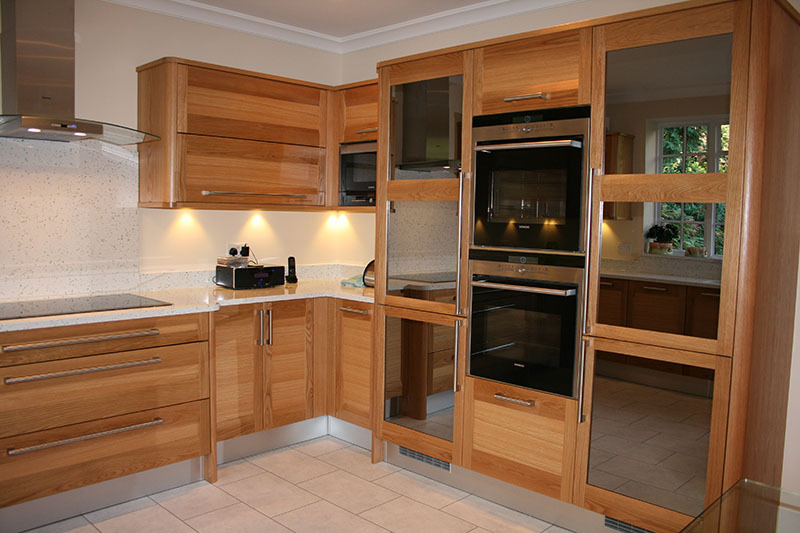 A traditional material but treated as a contemporary solution, in this case the tall housings have mirror panels on each side of the ovens, giving a feeling of space and reflecting the garden as part of the kitchen. 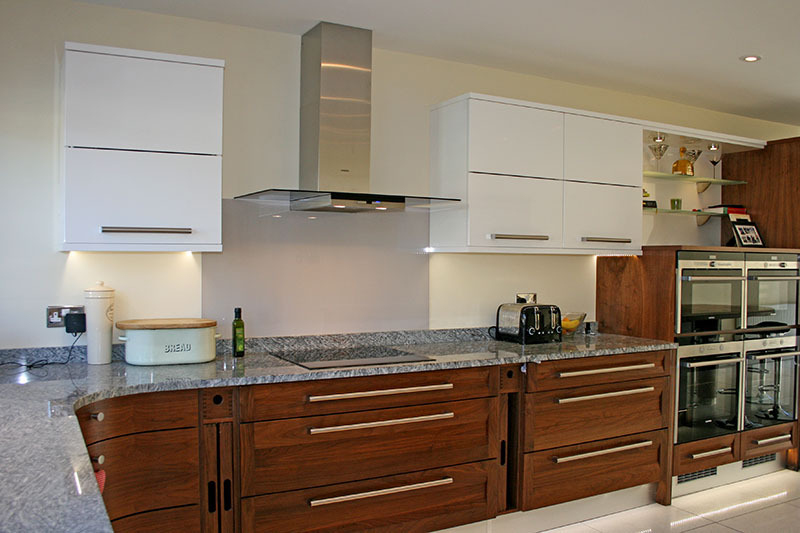 The use of 30 mm composite stone tops with green glass pieces in the surface makes a pleasant contrast to the oak doors. A light and airy solution. 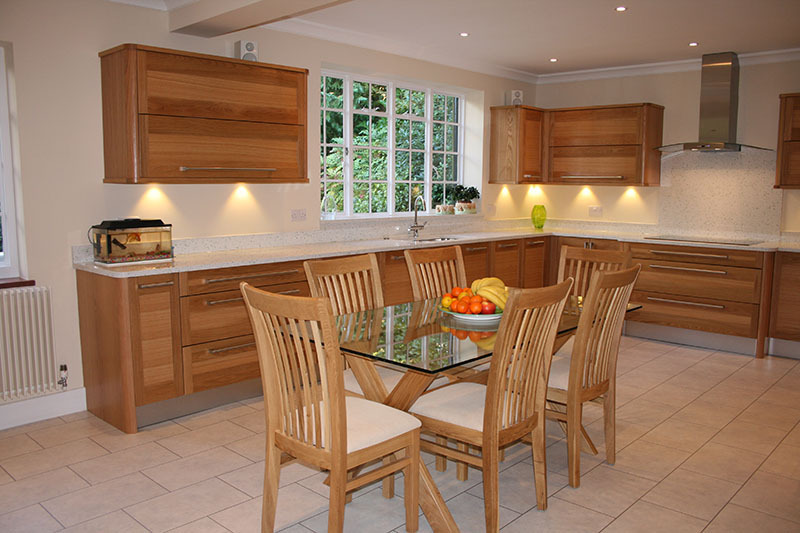 Stoneham supplied light oak Strata furniture with long bar handles, each wall cabinet has 50m thick curved edge panels giving the design a soft edge. 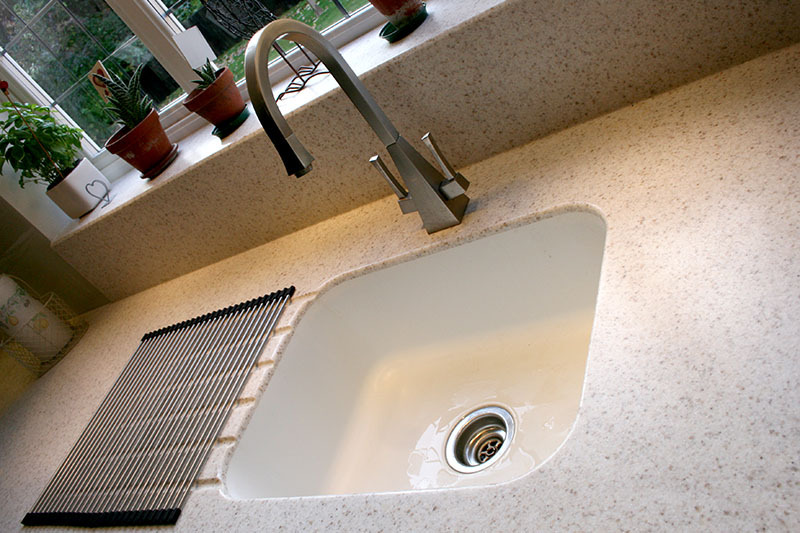 The Composite stone work tops supplied by Stone Italiano are coloured with green glass and set off the under mounted stainless steel sink. 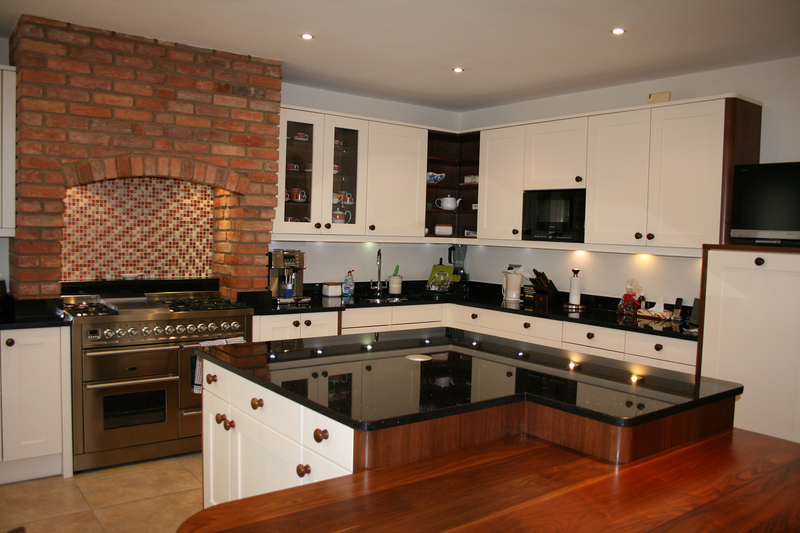 The kitchen is finished with an upstand and a matching hob back panel. 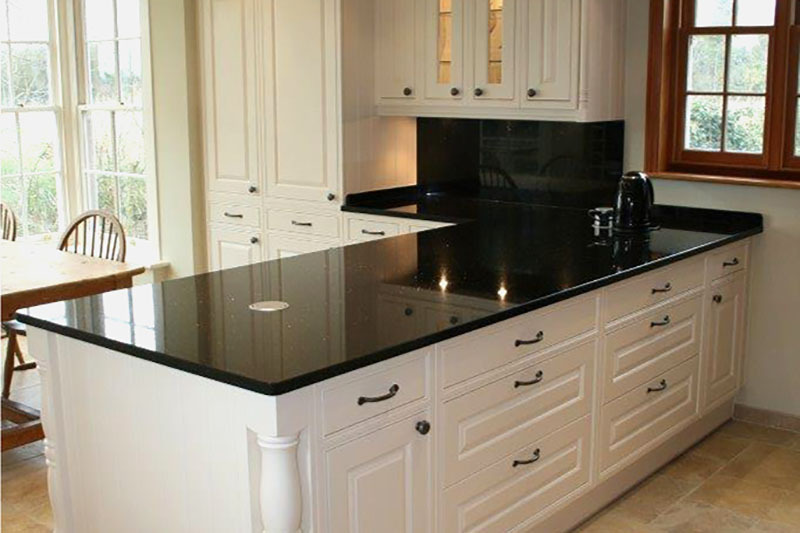 This traditional hand-painted Shaker style kitchen door, granite work tops, and stainless steel appliances met all the requirements of our very happy client. 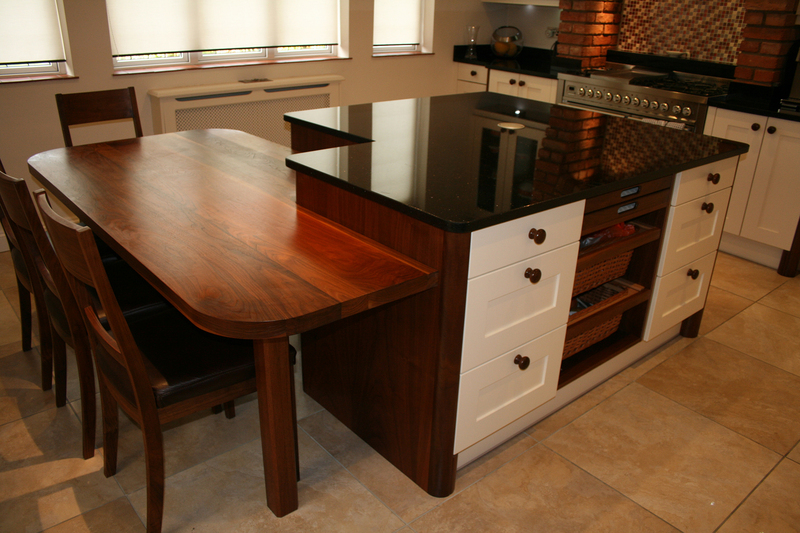 The space available for the kitchen was large enough to create an ‘L’ shaped kitchen and centre island with table height seating in wood. 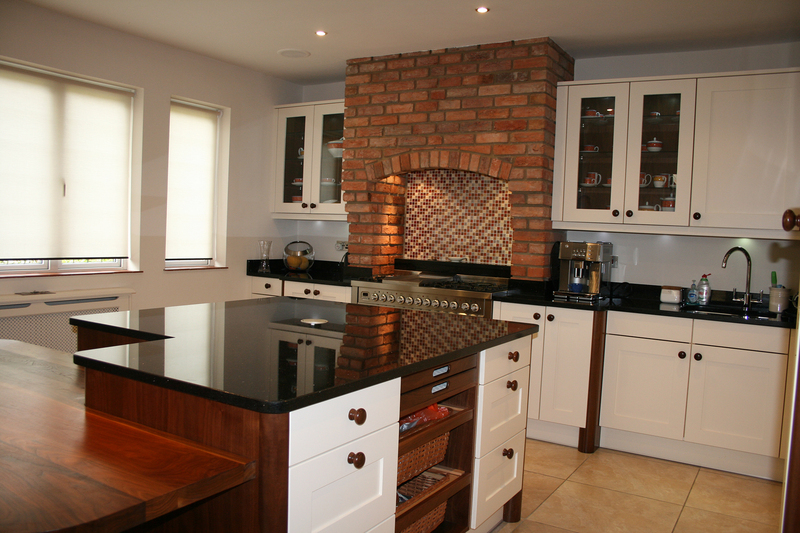 A feature brickwork chimney and range cooker were the focal points of this beautiful and practical kitchen. 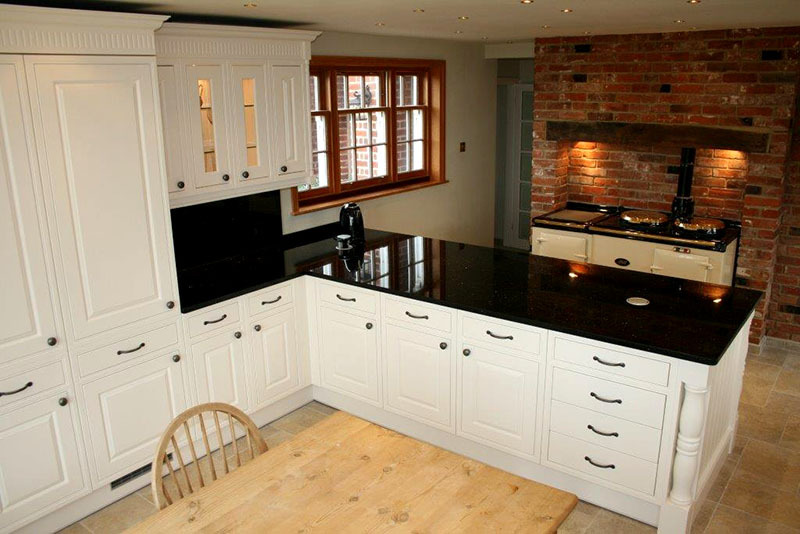 The Edwardian wall and base units were supplied by Stoneham and hand-painted by our specialist to our clients choice of colour. 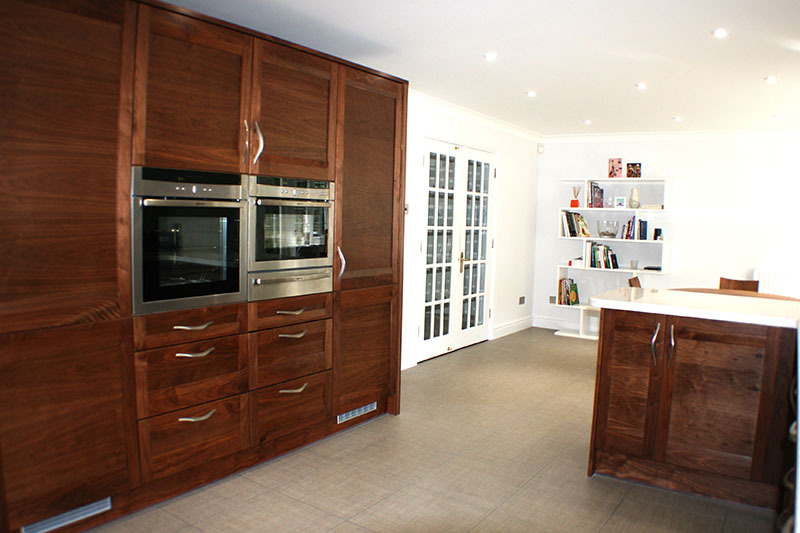 All units had cherry knobs, end panels, interiors and table in the same timber finish. 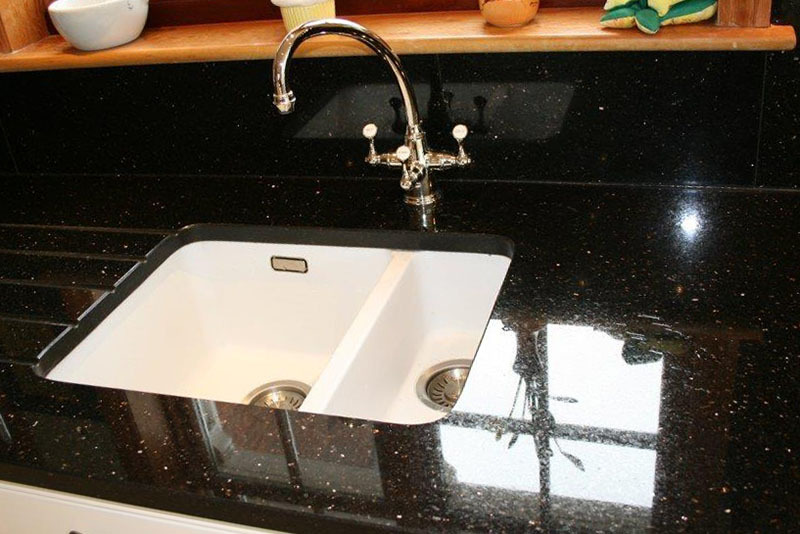 Work tops throughout were supplied in 30mm thick Star Galaxy granite. 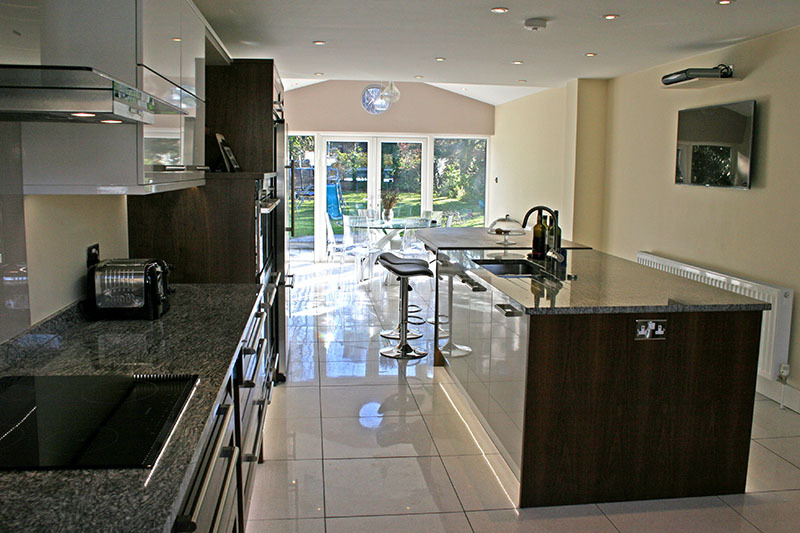 This high gloss finish mirrored the kitchen which was the clients intention. 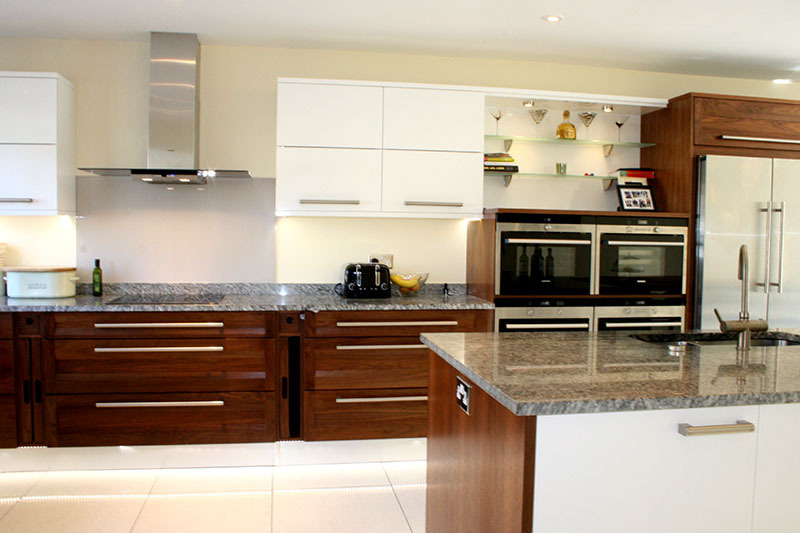 All appliances were integrated, with the exception of the stainless steel multi-function range cooker. 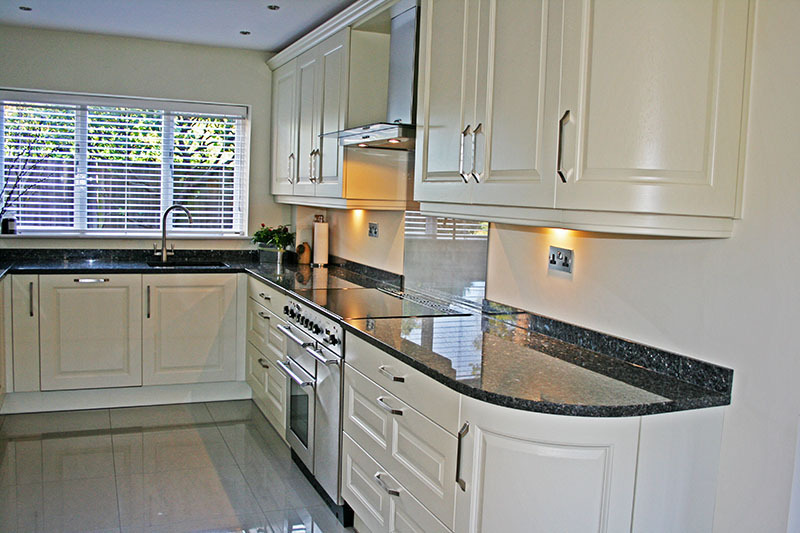 This kitchen was part of a major refurbishment for a family with three young children. 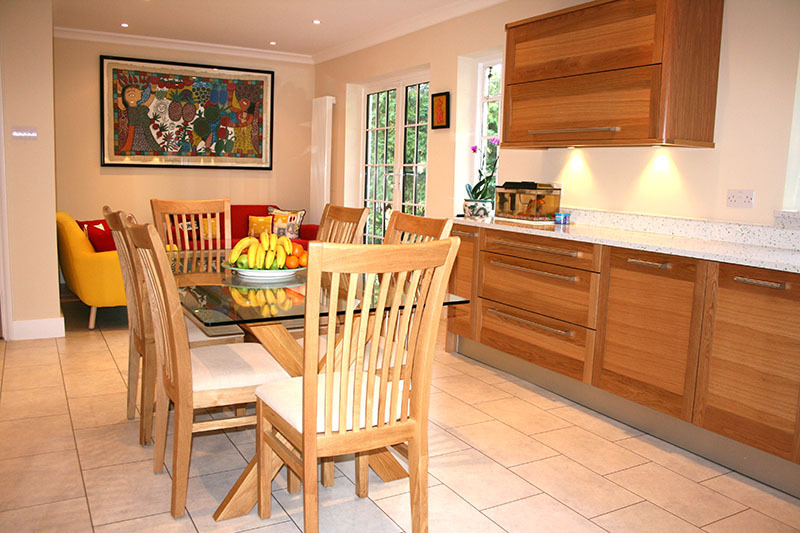 The key to the project was to remove the wall between the existing kitchen and dining room to make an open, airy space overlooking the garden. 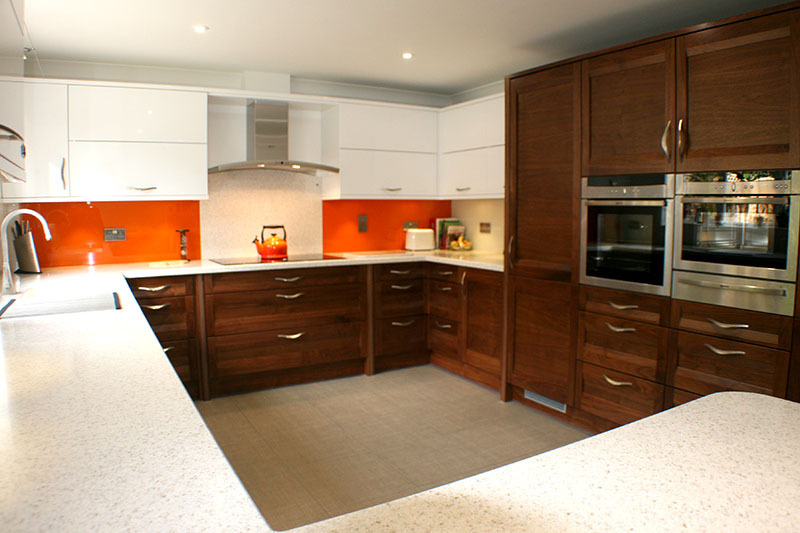 The contrasting doors, mixing both walnut wood and high gloss white melamine look very refreshing. 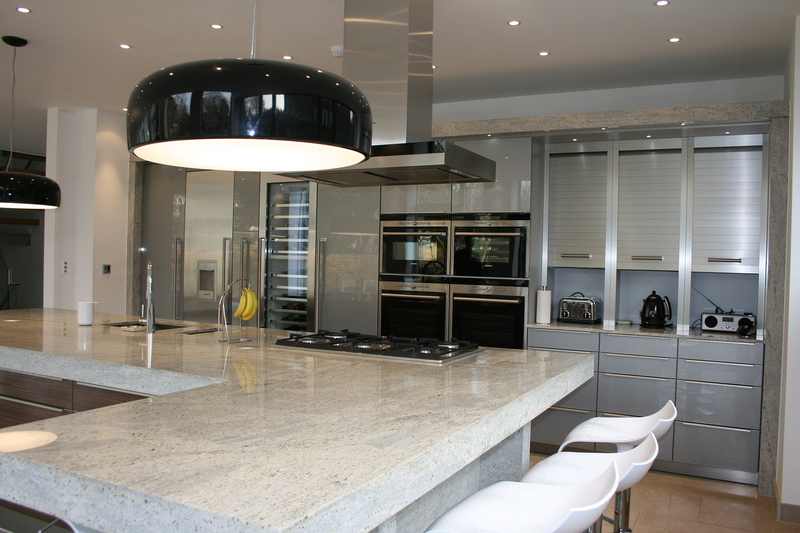 30mm granite worktops with lighting groove detail for LED lights add an extra dimension to this modern style. 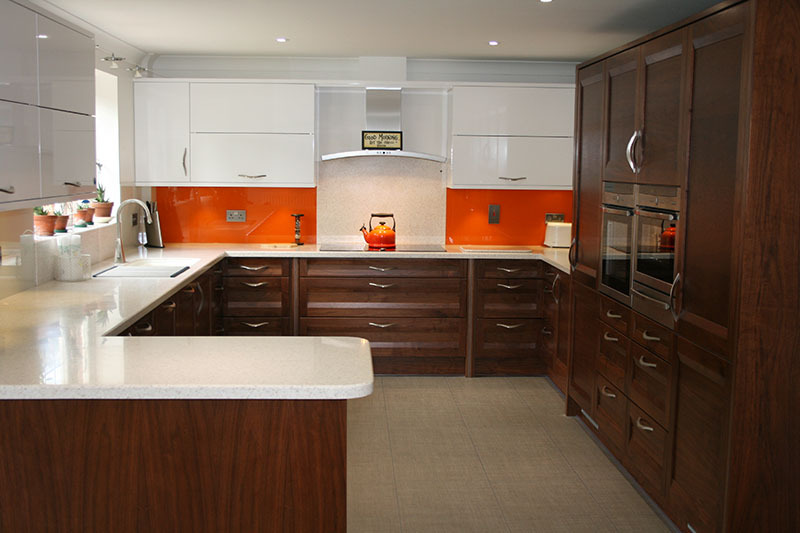 A combination of Stoneham Strata Walnut and white high gloss Pulse gave a contemporary finish. 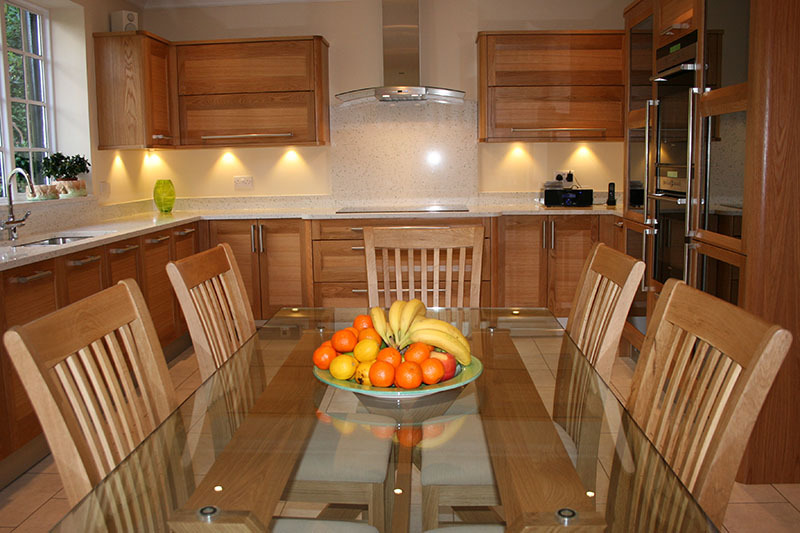 High spec Siemens appliances, silver cloud granite worktops and a walnut wood breakfast bar to seat five people. 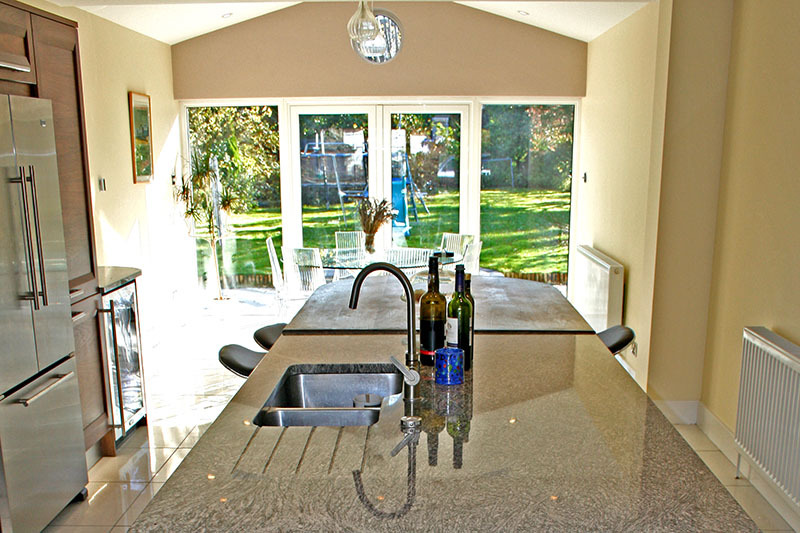 Worktops and plinth lights reflect on to the high gloss ceramic floor tiles. 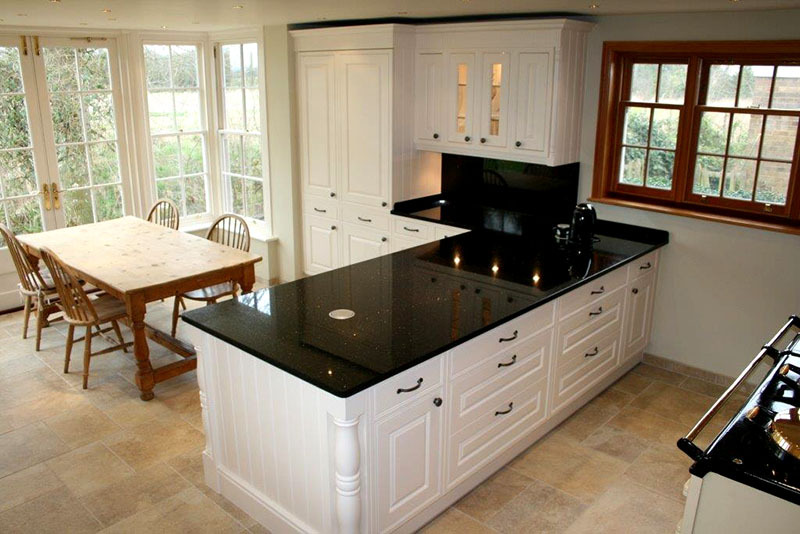 We recommended Stoneham Goddington painted solid oak kitchen doors in Cotton white to combine with high gloss pearl blue granite work tops. The combination gave it the WOW factor. 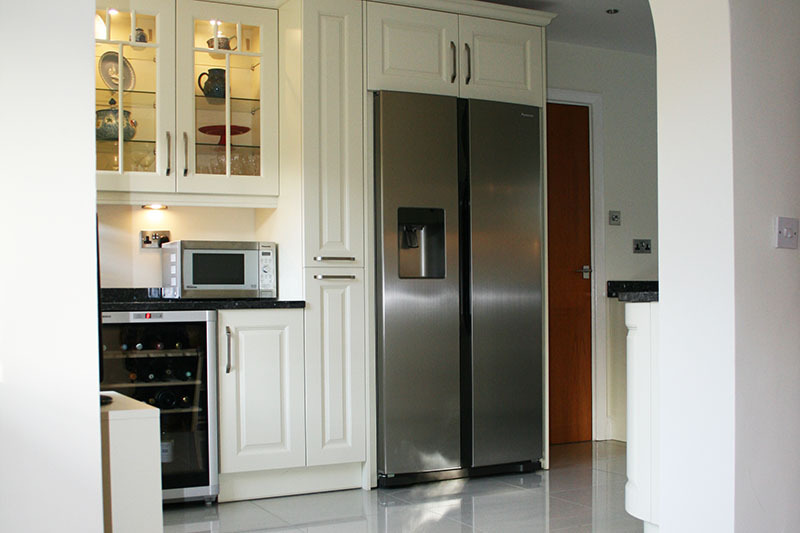 A stainless steel modern range cooker and American fridge completed the look. 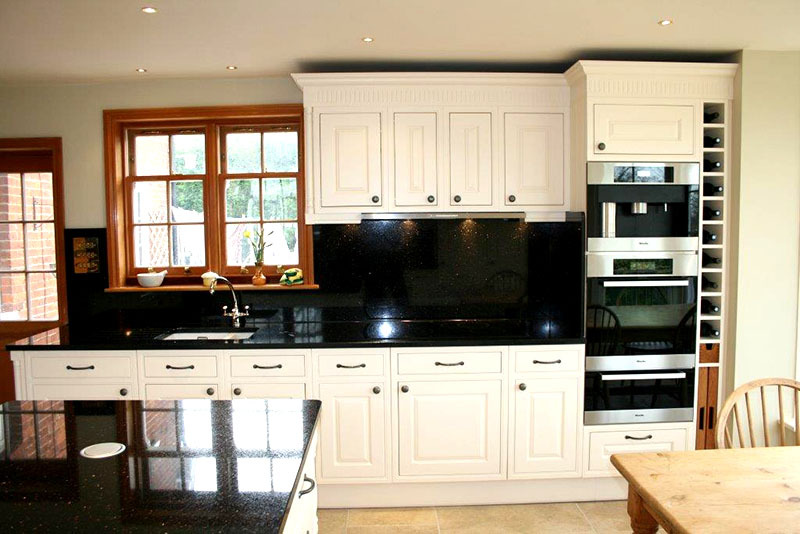 A classic white spray painted country kitchen worked beautifully with our client’s Kentish cottage. Molding detail was added between the wall units & cornice. 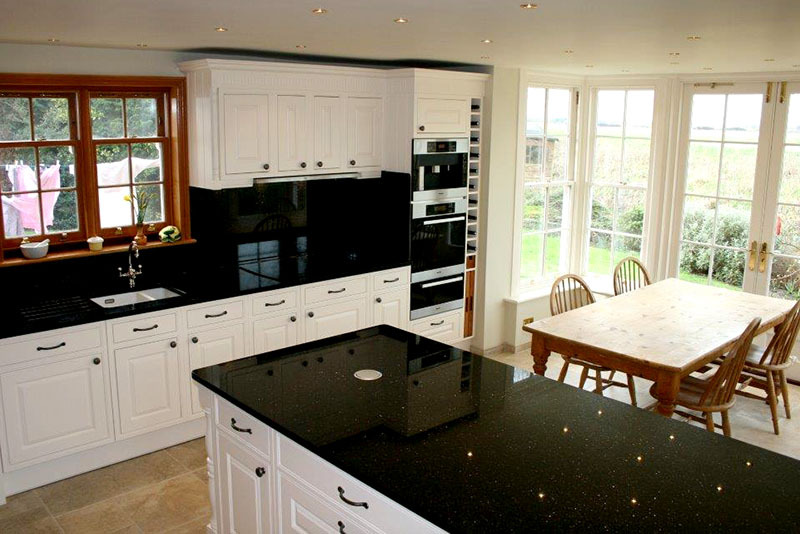 Black granite tops contrasted with the white ceramic sink & furniture. 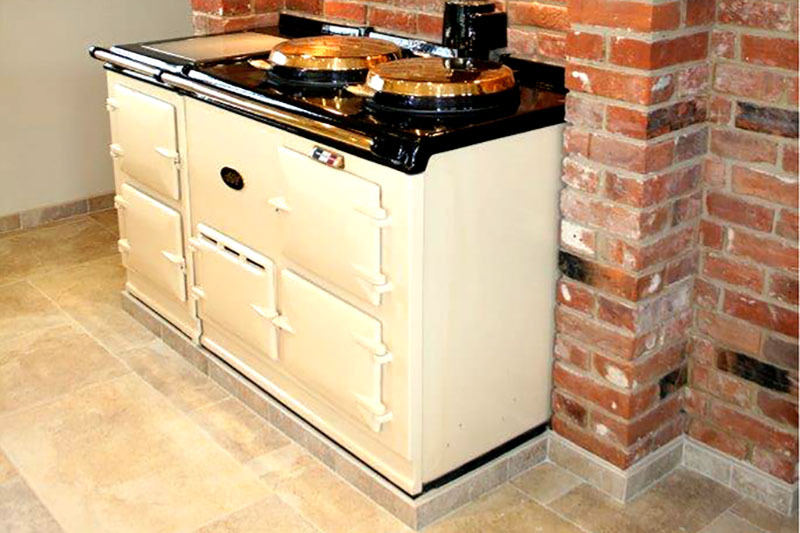 The peninsular top is large enough for any culinary challenge and together with the range cooker in a brick chimney recess, completes a very practical kitchen. 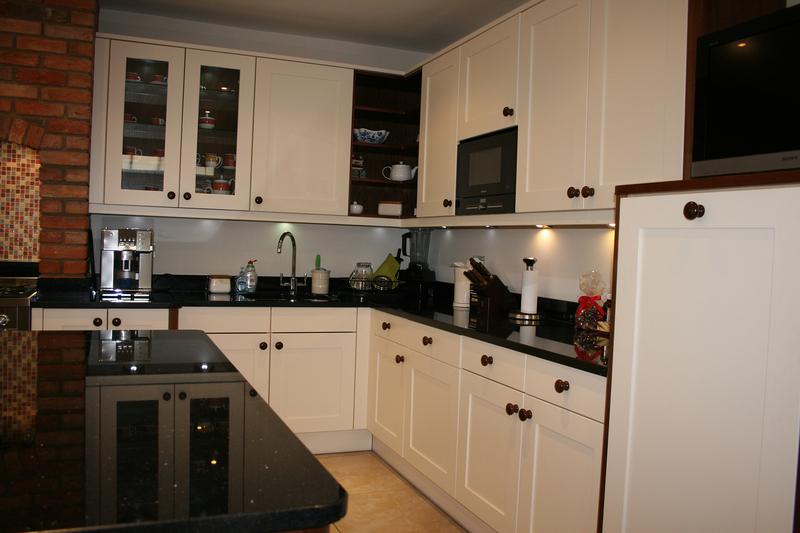 Stoneham Scotney classic white framed furniture with beaten pewter effect handles and knobs. 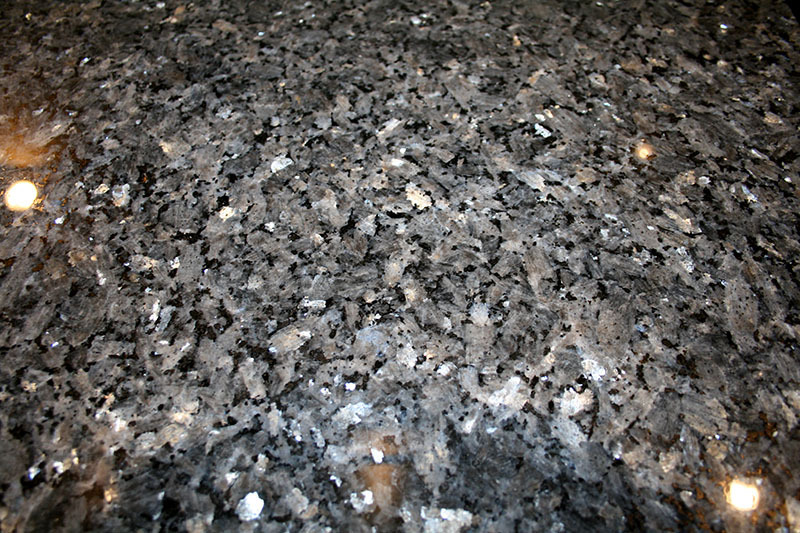 Tops are 30mm Star Galaxy granite with back panels and up stands. 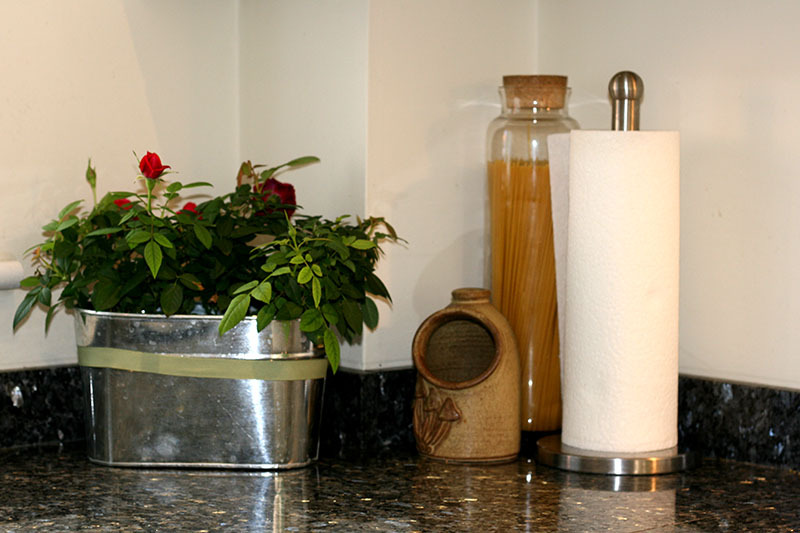 Pop up plug towers in the worktops eliminate the need for electric plug sockets. 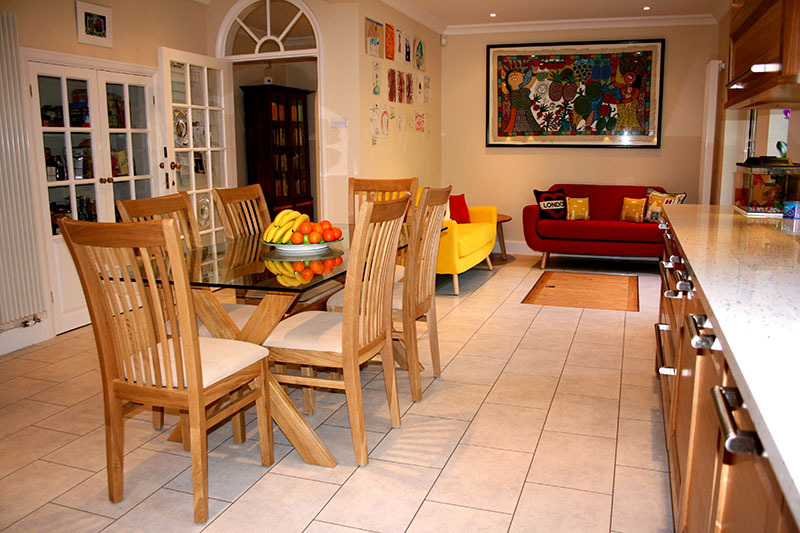 This very contemporary solution to a Grand Designs style home is the focal point of a spacious family room. 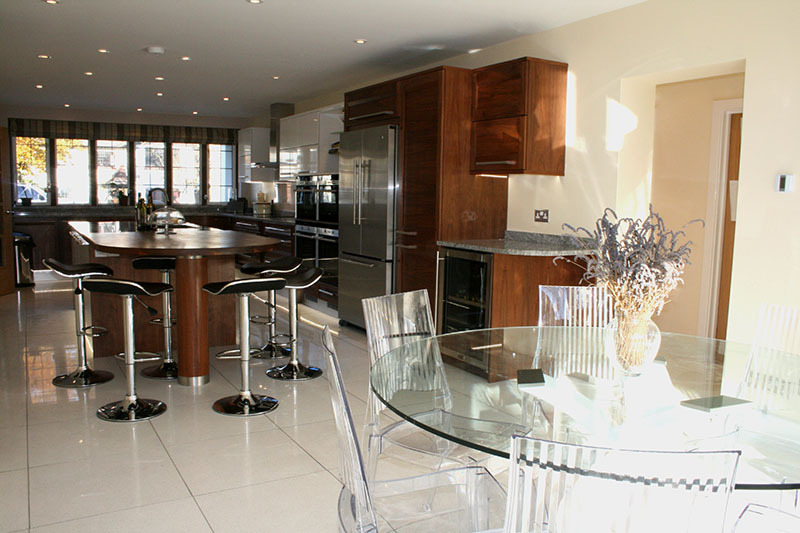 To complement the kitchen we used a high gloss grey tall units & high gloss wood island furniture surrounded by figured granite tops & down turned panel. 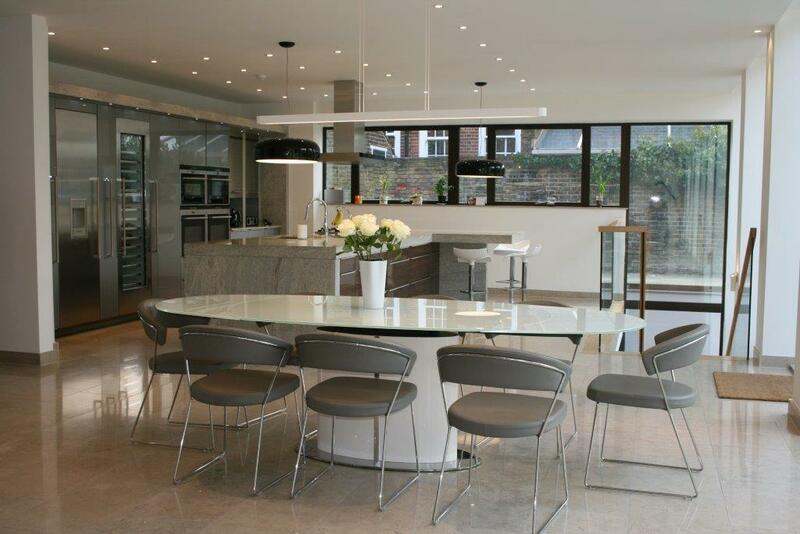 Mixed with Siemans and other quality appliances, the whole concept integrated with the modern look required for such a beautiful home. 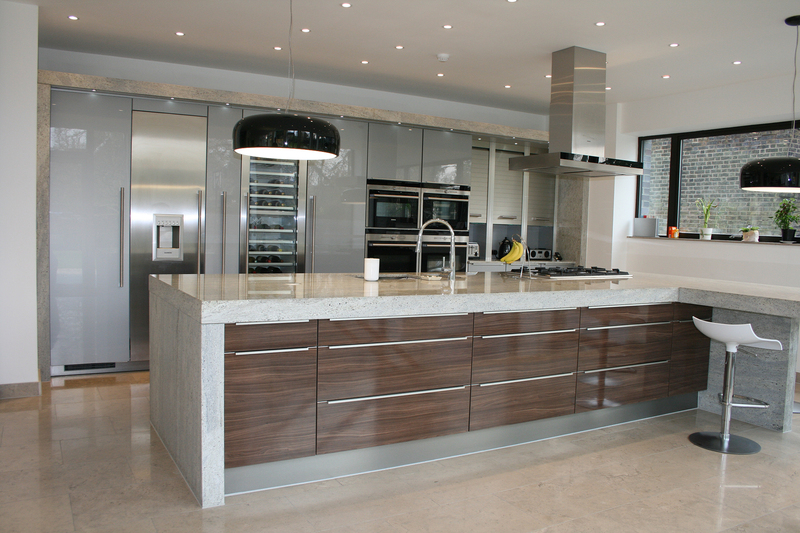 Beckermann Kitchens of Germany produced this on-trend combination of high gloss laminate wood and grey laminate doors. 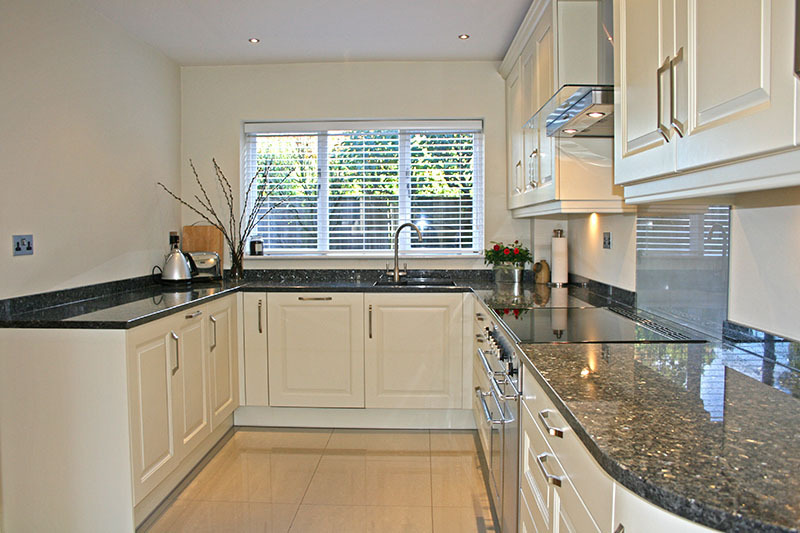 The island worktops are 100mm thick Kashmir White granite which is repeated round the tall appliance housings. All in all this combination of mixed materials works well together. 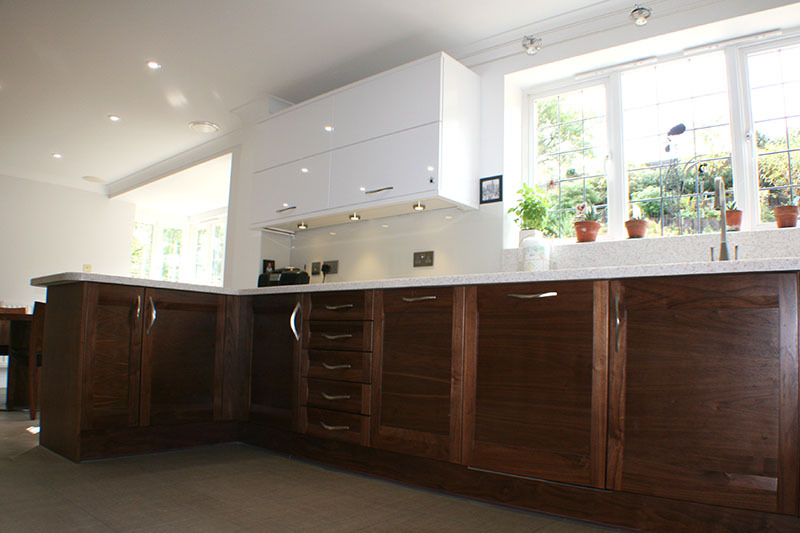 Walnut with white high gloss doors and composite contrasting tops. 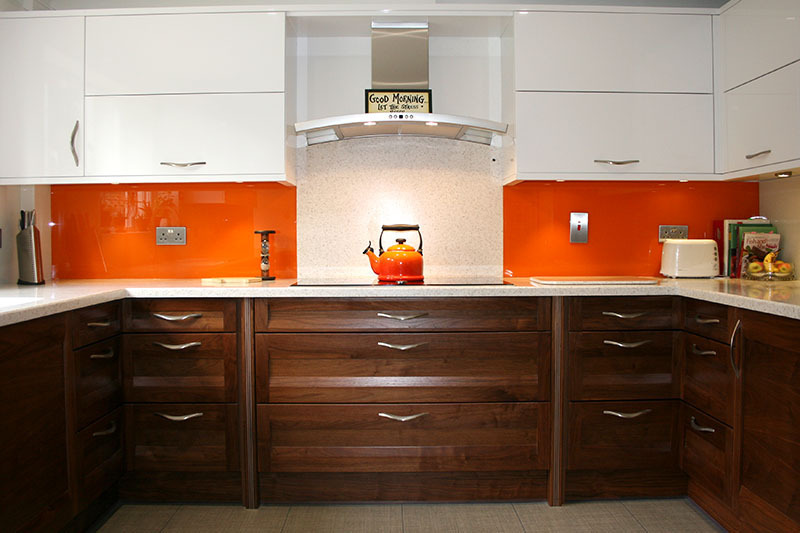 Good accessible storage was offered by the manufacturer using the latest interior fittings. 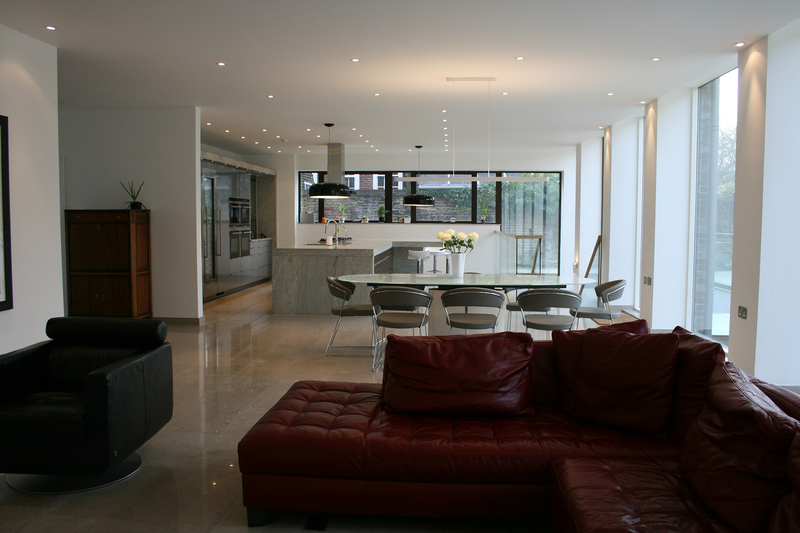 Bifold wall units lift up and away to leave clear access to the interiors. 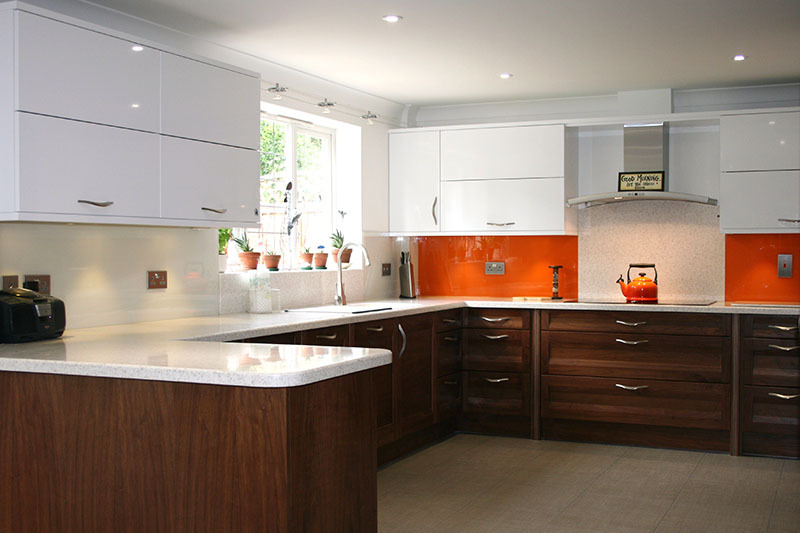 A bold orange glass back splash and panels finish the kitchen and the Amtico floor ties the design together. 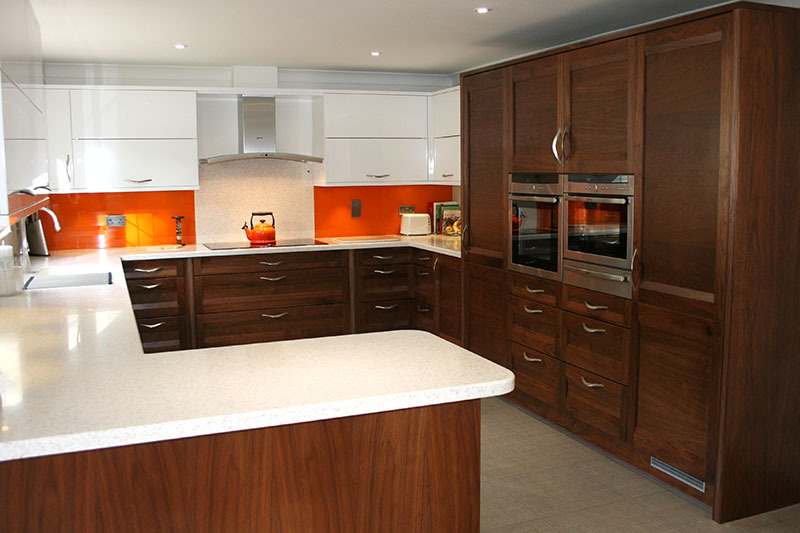 Stoneham Strata walnut bases and wall units with Pulse white high gloss wall units. 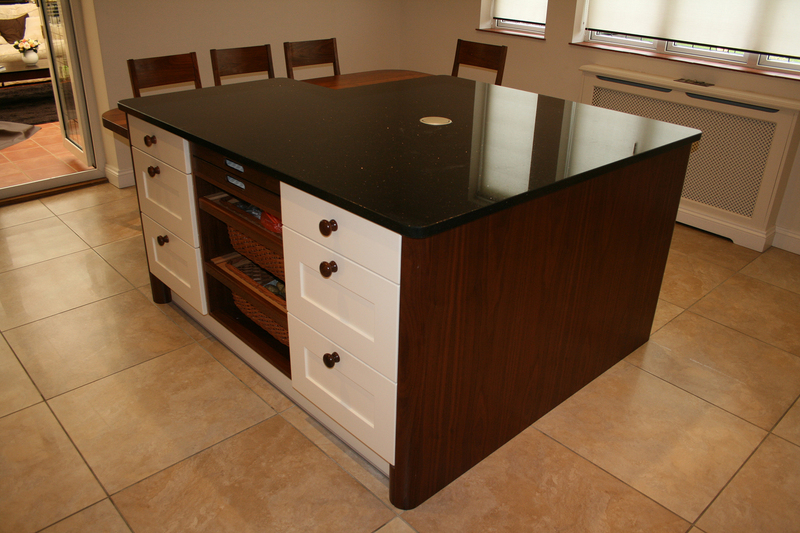 Worktops were in LG.Himax, colour Tambora, a similar material to Corian with seamless joints and moulded sinks and upstands with built in Neff appliances. 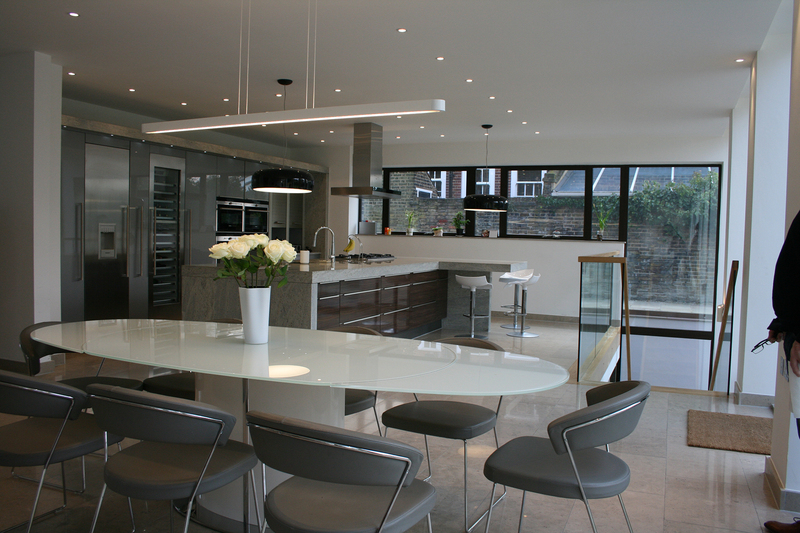 Back splashes in 6mm toughened glass supplied and sprayed by Glass London.